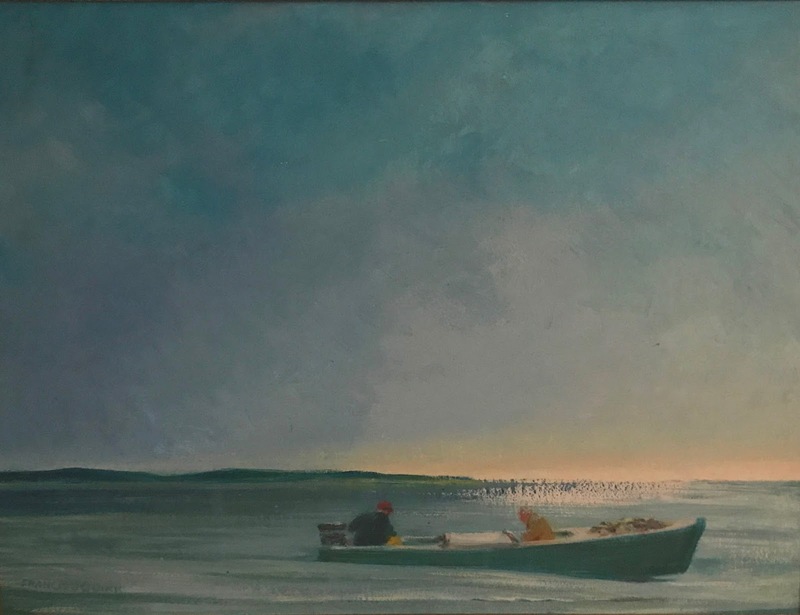 Through our blog we have been contacted by the owner of a previously unknown maritime painting by Francis Quirk. The wonderful work is "Boat in an Ocean" which depicts an outboard-motor powered boat carrying two people cruising beneath a blue sky. Perhaps, they are returning from a day of fishing. The boat is riding fairly low in the water and the bow has some cargo that might be fish, shellfish or netting. 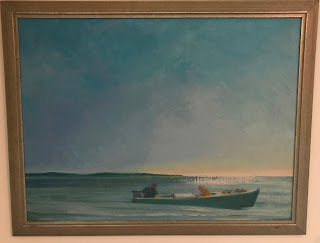 The painting was most probably painted in coastal Maine as Quirk had a house in Saco in the Kinney Shores neighborhood on Old Orchard Beach. He greatly enjoyed depicting maritime settings. This work is a bit different stylistically from other Quirk paintings in that the sky dominates the canvas. The artist has captured the period of morning light before the sky turns pink or the sunrise. The color palate is typical of his work. The owner of the painting recently purchased it in a shop in central Pennsylvania. We greatly appreciate the owner of this painting reaching out to us and providing these images.